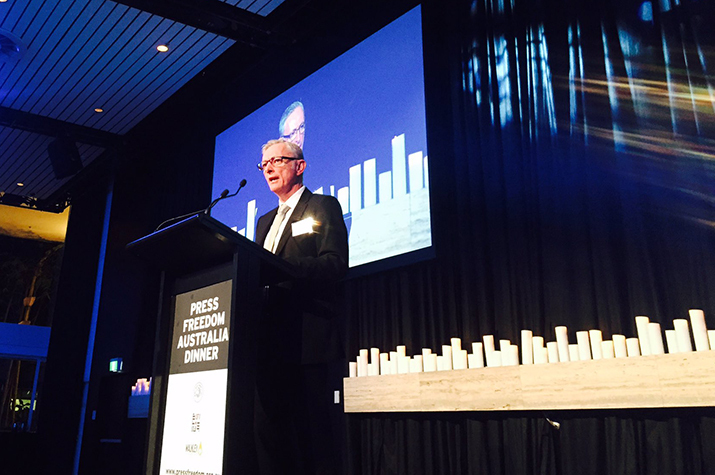 MEAA CEO Paul Murphy speaking at the 2017 Press Freedom Australia dinner in Sydney on April 28. The speech delivered by MEAA CEO Paul Murphy to the 2017 Press Freedom Australia Dinner in Sydney, April 28 2017. I wish to acknowledge and show my respect for the traditional owners of the land on which we are meeting: the Elders, past and present, of the Gadigal people of the Eora nation. I’d like to thank all of you for being here tonight. This is the biggest fundraising event of the year for the Media Safety and Solidarity Fund. Every dollar you give tonight goes to support vital projects in the Asia Pacific region. The fund was established in 2005 by the journalist members of MEAA as a way to support press freedom in the Asia-Pacific. The fund is overseen by a committee of working journalists, and projects are delivered in partnership with the International Federation of Journalists, to support press freedom projects throughout our region. It also provides assistance for journalists and their families undergoing hardship due to war and natural disaster. Recently it has provided disaster relief to the families of journalists devastated by the earthquakes in Nepal in 2015 and Cyclone Pam in Vanuatu in 2016. In the Philippines last year, nearly $46,000 went to fund the education of the children of journalists killed in the course of their work - 65 children are receiving an education they otherwise would not have. In Nepal $32,000 was allocated to the education of 31 children in similar circumstances. READ: The speech by Sky News political editor David Speers to the Press Freedom dinner. It’s important to remember in many parts of the world, journalism is a deadly occupation. At the end of 2016, nearly 260 journalists were imprisoned around the world. Another 93 had been murdered in targeted killings, bomb attacks or cross-fire incidents. And 2017 is showing no sign of improvement. It is particularly disturbing to contemplate the message being sent by the spectacle of Donald Trump’s continuing attacks on the media. While for an audience like us he and his administration have provided moments of comic relief, with their mangling of language and logic, we should never forget the seriousness of his attack on truth. For someone like Erdogan in Turkey, who currently has more than 100 journalists in prison and has shut down more than 100 media outlets, the message coming from the US is surely one of encouragement for his crackdown. For a Putin in Russia, for a Duterte in the Phillippines , the mantra of fake news thrown at public interest journalism is a green light for their darker instincts. Wednesday next week is UNESCO World Press Freedom Day. On that day, MEAA will release our 13th annual report into the state of press freedom in Australia – this year it’s entitled The Chilling Effect. An apt title given there has been plenty of talk this year about freedom of speech. Although not much progress in terms of action by our Parliament to protect it. In fact, the same day that Parliament’s so-called “freedom of speech” inquiry handed down its report into section 18C, the Director-General of Asio informed Parliament that his agency is spying on journalists and media organisations using Journalist Information Warrants. These warrants secretly trawl through your telecommunications data, and the data of your media outlet, in the hunt for whistleblowers and your confidential sources. So amid the talk about freedom of speech there have been an actual, legislated, assaults on press freedom. The parliament has now legitimatised the government secretly using metadata to pursue whistleblowers who reveal government stuff-ups. Our lawmakers have also introduced prison terms for reporting on Asio special intelligence operations. And thanks to a Senator’s suggestion, these penalties are to be extended to journalists reporting on Australian Federal Police operations. Jail terms for journalists, reporting legitimate news stories in the public interest, that is the reality we have now. And while lawmakers’ efforts have focussed on criminalising journalism and going after whistleblowers, long-standing press freedom concerns continue to be ignored. There is a dire need to reform Australia’s uniform national defamation legislation that allows people to be paid thousands and thousands of dollars in damages for hurt feelings, without ever having to demonstrate they have a reputation, let alone one that has been damaged. The regime was meant to be reviewed in 2011. That review was revived in 2015. It is still stalled. Meanwhile, Queensland, South Australia and the Northern Territory continue to refuse to introduce shield laws for journalists who face jail terms for refusing to name their confidential sources. In the era of borderless digital publishing and jurisdiction shopping, it is only a matter of time before someone decides to use the courts to pursue a journalist who will then cop a fine, a jail term or both, for maintaining their ethical obligation to protect confidential sources. Finally, our lawmakers and their law-enforcement agencies have been woeful in ensuring justice for murdered Australian journalists, as the cases of the Balibo Five, Roger East, Paul Moran and Tony Joyce tragically show. Those responsible for their deaths are getting away with their murder. The champions of press freedom need to do more than cloak themselves in glib phrases. Genuine roll back of laws that undermine press freedom is vital if democracy in Australia is to function. I ask you to read our press freedom report next week and support our campaign for the public’s right to know. And I urge you to give generously tonight to support the Media Safety and Solidarity Fund’s work in the Asia Pacific. Thanks in advance for your generosity. Now I’d like to leave you with a press freedom video package kindly produced for us by SBS. The package includes some of the children who have benefitted from the Media Safety and Solidarity Fund’s support for their education. Thanks once again. Now read Sky News political editor David Speers’ speech to the Press Freedom dinner.